It's that time of year again to scare yourself silly while drowning in copious amounts of sugar: Halloween. With PlayStation VR joining the ranks of HTC Vive, Oculus Rift and Gear VR, virtual reality is the obvious way to enjoy horror games and experiences. While you take a break from traditional scary movies and handing out candy, check out our finds of the best VR horror games and films to try. We've also tried to keep the descriptions to a minimum so you can be entertained spoiler-free. Ghost Town Mine Ride & Shootin' Gallery is a new haunted mine ride experience from Spectral Illusions that has you exploring an abandoned tourist attraction. You'll have to test your shot at the Shootin' Gallery and board the mine cart ride for a descent into hell. The 25 minute, fully immersive experience allows the player to alternately move freely and on the rails as well which should add to the scary gameplay. From developers Raw Lion Workshop, this eerie puzzle adventure title has you in a dark, surreal world full of mysteries and inhabited by strange creatures. Explore and interact with the environment to discover the nature of this strange new reality, learn the story of its inhabitants and get immersed in the world of horror and beauty. Face Your Fears exposes you to terrifying scenes based on common fears and phobias. For example, in Skyscraper, a player stands on the ledge of a skyscraper in the middle of a big city. and when looking down, a giant robot is climbing up towards you. In the Haunting, you experience the fear and excitement of a creaking house bringing you back to times when you were a scared little kid. Honestly, if that kid in the picture above doesn't send a chill down your spine, you're far tougher than we are. In this game, you play as a pizza delivery person - who may or may not be delivering your last pie ever. Play by running around or simply doing nothing as you approach a boarded up, overgrown house in the pouring rain...near midnight. There's not much else to say except to play the game for yourself. 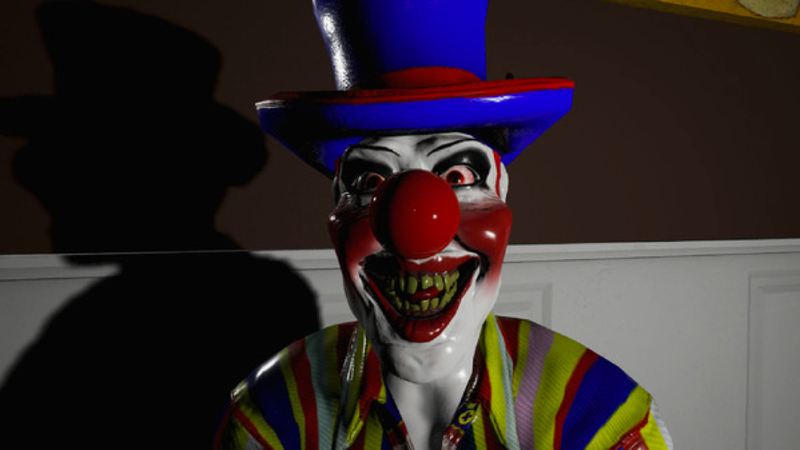 The main image in this article - aka the clown from hell - is also from Emily Wants To Play. This VR game is one of the most fun yet with its jump scares, you'll either really regret plopping on a headset to try it out or absolutely love it. The title's been around since the early days of rift DK2 as well so the creators have some experience scaring the crap out of you in VR. For those who own an Oculus Rift, this Halloween weekend, you can snag the following games for a whopping 50-75% off. We've tried most of them and can say most, if not all, are worth checking out on Gear VR or Oculus Rift. Dark Days - You must figure out what's going on with an eerie desert motel and its surroundings by solving a number of puzzles. Jump scares definitely included. Dead Secret - This game mystery thriller has you asking one main question: Who killed Harris Bullard? Boogeyman- Play this one with a flashlight and your screams. Seriously. Albino Lullaby- Another mystery but this time, it's set in a Victorian town where you're trying to figure out where...and what you are. Into the Dead- One word: move. Keep running to stay alive, gather items to help you stay alive and oh yes, zombies. Lots of zombies. Euclidean- A horror puzzle game where you continue to descend deeper and deeper into madness. Dreadhalls- This one's a classic by now and likely a title you already own. If not, have fun trying to find a way out of this dark dungeon. Invisible is a 5-part miniseries from Doug Liman, the guy who directed The Bourne Identity and is at the helm of this mystery thriller. Available on all the major headsets including Gear VR, Rift and Vive, this free series takes you on six minute experiences that include cliffhangers, crazy twists and more. It's not entirely in the horror genre but makes for good edge of your seat entertainment if you need a break from all the other scary goodies. This one's a whole lot of nope. Just from that mask alone in the thumbnail, we didn't really want to watch it. There's no description for the video but it's safe to say the 'film' is weird, surreal and leaves you hoping Easter won't come next year. This one's a little older but still worth checking out. Let's just say you may never want to go camping again. Or stay inside a tent. Ever.